New York City Stage: Hallelujah, I Saw The Book of Mormon!!! Hallelujah, I Saw The Book of Mormon!!! Mayor Bloomberg and his companion were in the house. Katie Couric was in the house. Seniors were in the house. 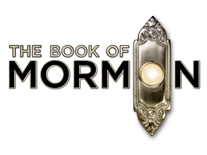 And dang gosh, thanks to the Mormon Lottery, I too was in the house in the front row of the Eugene O’Neill Theatre to experience the hottest musical comedy on Broadway – The Book of Mormon by the creators of South Park and Avenue Q. Two Mormon missionaries (Elder Price played by Andrew Rannells and Elder Cunningham played by Josh Gad) are sent to Uganda (which by the way is nothing like The Lion King) to enlist Africans, plagued by AIDS, poverty, female mutilation and other atrocities. With edgy numbers such as Hasa Diga Eebowa, Spooky Mormon Hell Dream and Joseph Smith America Moses and a theme that religion – made up or not – unites and gives people hope, The Book of Mormon is fresh, profane, funny and a good time. Overall, I believe that The Book of Mormon is the best musical that I’ve seen on Broadway since Next to Normal. After the performance, a small crowd waited outside the stage door. When the cast finally began to emerge (they were busy taking photos backstage with Major Bloomberg), they signed playbills and posters. I could not help but tell Nikki James (who plays Nabulungi) how much I loved her Tony acceptance speech. Graciously, she said that Tony night was the best night of her life. I saw book of mormon last night with . so amazing.i've been listening to the soundtrack all day. "scary mormon hell" is the bestest. so so so glad it came to chicago.